The layout of the restaurant takes full advantage of its location in a thin row house. Downstairs, you have the bar and pizza oven, which take up most of the first floor. The second and third floor are where the tables are. Overall, the restaurant can only hold a mere 59 people according to the Fire Marshal. Our hostess was very helpful. We were there with Noah, and she was very interested in both him and Amy. How old is he? How are you feeling? We get that just about every place we take him too, and who can blame them? He's a beautiful baby. The hostess was able to get us a table for four, which was nice because we could put Noah's carrier in a chair while we ate. We had some of the infamous mini burgers. They come in batches of three, six, and nine for $7, $11, and $14 respectively. They're worth every penny in my opinion. The brioche buns are coated in about a quarter stick of butter each. The burgers are made with what seemed to be fresh Angus beef and topped with pickles and cheese (if you like). I could do without the mountain of onions strings, which seem like filler and are more of a distraction than anything else. I think the next time I go to Matchbox, I'll get two orders of the nine mini burgers. To soak up some of the grease, we had a salad as well. The Bistro Salad was mixed greens with pear and toasted bread topped with goat cheese. We only ordered a half portion for $7, but it was plenty after the burgers. I rather liked the method of having a full piece of toast (rather than little croutons), buttered and toasted, and then topped with the goat cheese. It allowed you to tear off pieces of the "crouton" and mix it with the salad. The goat cheese was tangy like it should be and went well with the sweet vinaigrette. For the big finale, we had the Matchbox Meat pizza. It came topped with tiny pepperoni, bacon and a spicy Italian sausage. While the toppings were fresh and flavorful, I wasn't all too crazy about the crust, which was weak and bland. Pizza, for me at least, is all about the crust. If the crust doesn't rise at the edges, there's something wrong with it. Also, the cheese and sauce went all the way to the edge of the crust. Eh. I also have to note that the bar at Matchbox serves Magic Hat #9 on tap which gives it huge points. I know it's not the only place that has it on tap in the area, but still it's a great beer. I think I'll be back to Matchbox the next time I'm over by the MCI Center. The mini burgers are worth the trip alone and I'd like to try some of their entrees rather than the pizza. Parking: There's not very good street parking in the area and there's no valet. Take the Metro. Baby-Friendly Rating: 3 out of 4 diapers. The stairs make for a difficult trek with the baby carrier and stroller, but the hostess made up for this with how accommodating she was. You'll notice the new baby-friendly rating which is my diaper scale. No, this doesn't count the number of times we have to change Noah's diaper at the restaurant. It's just my ranking of how accommodating I think a place is for people with a baby. I got this email the other day from the Ceiba mailing list about a second Po' Boy Power event. Following the success of its initial event, a second "Po' Boy Power!" fundraiser has been scheduled with the support of the Washington DC chapters of Les Dames d'Escoffier and Slow Foods International. This event will be held November 1, 2005 , All Saints' Day, a religious holiday widely celebrated in New Orleans. Po' boys will be sold for donations of $25 and up at Acadiana (a Louisiana style restaurant under the helm of Executive Chef Jeff Tunks), located at 901 New York Avenue, NW , in Washington DC. Sandwiches will be sold from 11:30 am-2:30 pm . The po' boys will be assembled by female chefs from the DC area paired with politicians and other local personalities with ties to Louisiana. The first Louisiana dignitaries to come on board were The Honorable Lindy Boggs, Congressman Charlie Melancon, and former Congressman Robert Livingston. Donations from this event will be used to limit the devastating effects of Hurricane Katrina on Louisiana farmers, harvesters, fishermen, and seafood purveyors. All funds raised will be distributed directly to affected farmers through Slow Food International's Terra Madre Program. Can the women top the $27,000 the group of male chefs raised in September? So far, we can look forward to the talents and efforts of Laurie Weber Alleman (The Swiss Bakery), Susan Callahan (Synergy Arts), Ann Cashion (Cashion's Eat Place and Johnny's Half Shell), Gillian Clark (Colorado Kitchen), Patrice Dionot (L'academie de Cuisine), Ruth Gresser (Pizzeria Paradiso), Carla Hall (Alchemy Caterers), Kate Jansen (Willow Restaurant), Haidar Karoum (Asia Nora), Janis McLean (Red Dog Cafe), Bridget Meagher (Alexander's in Charlottesville), Joan Nathan (cookbook author/writer), Nona Nielsen-Parker (Stone Mill Bakery, Cafe & Catering), and Anna Saint John (Catering by Anna Saint John). The first "Po' Boy Power!" fundraiser was held at Acadiana restaurant in Washington DC on Monday, September 12, 2005 and raised more than $27,000 for the Louisiana Disaster Recovery Foundation. Last night, Amy and I had our first dinner out with our son Noah. We were pretty nervous about what would happen. Would Noah fuss the entire time and make everybody's dinner miserable or would he be the adorable little angel that he usually is? Only time would tell. We decided we wanted to go somewhere really casual. It'd been about nine months since Amy had eaten sushi, and she really had a craving for it -- I didn't blame her. If I'd gone that long without sushi, I'd probably go out of my mind. I'd read about Kotobuki -- how its prices were extremely cheap and its sushi is optimally fresh. I figured this was a good time to try it. Getting to Kotobuki isn't the easiest task in the world. If you can find a direct route from Cleveland Park to Palisades, you know DC streets better than I. It took me a lot longer than it should've to get there. On the way over, I could tell there was a possibility that Noah was going to have a fussy night. Usually a car ride puts him right to sleep, but this time he was fussing and crying on and off. Luckily, the drive was longer than I thought so he was asleep by the time we were there. There's plenty of parking on the streets around Kotobuki, which is good because the only Metro access is via bus. The closest Metro station is Foggy Bottom. The restaurant is located in a townhouse. The top level is Kotobuki, the ground floor is the restaurant's office and the bottom floor is Makoto, the excellent Japanese restaurant that DC Foodies are all too familiar with. I'm assuming that both Makoto and Kotobuki are owned by the same people, although I could be wrong. We walked up to the second floor at about 8:30 PM. There isn't a whole lot of room up there. At the top of the stairs is a short sushi bar with five chairs. Around the room are small two-person tables that are as close to each other as seats on a Metro bus. Luckily, the waitress was able to clear a three-seater table in the corner so we didn't have to put Noah and his car seat on the floor. There were a total of five people working the restaurant: two sushi chefs and three or four waitresses. I'd say the whole place can hold about 20 people at the most, and there was a full house that night. The restaurant is decorated fairly makeshift, but with prices as cheap as you get at Kotobuki, who the hell cares. I took a look at the menu and my eyes nearly popped out of my head. I mean, seriously, it's $1 a piece for most of the Nigiri Sushi and prices peak at $1.75 a piece for Toro (fatty tuna). Most rolls are $2.55 or $3 for six pieces. I wondered if I'd been caught in some worm hole and shot back to 1984. Noah continued to be the little angel that he is. He just sat there quietly. I think The Beatles music playing over the speakers was soothing to him. Plus, I've noticed from our few trips to restaurants for lunch over the last couple weeks that he's at home at a restaurant. He likes the white noise in the background. Ok, so what was the sushi actually like? Well, we waited a while for our sushi to come -- probably about 25 minutes, so keep in mind that I was famished by the time our food was brought to out table. Kotobuki is certainly not a place to go if you want a quick in-and-out bite to eat. We ordered a couple rolls and about six or so Nigiri: toro, salmon, yellowtail and scallop. Surprisingly enough, I thought the BBQ eel roll was one of the best I'd ever had. The spicy tuna roll was quite spicy -- not hot, but spicy, and they didn't use Tabasco like some places. I saw some red pepper in the tuna which is why I think it was better. Every once in a while though, I'd get a little chewy fat in the fish which I didn't like so much, but I learned to ignore it. The scallop Nigiri was similar. The scallop tasted very fresh and practically melted in my mouth. I was enjoying it until I got a few crunches in the flesh of the scallop that sent my opinion of the scallop sushi southward. All of the other Nigiri were very fresh and tender though. One thing worth mentioning is that there are only two beers on the menu: Bud and Sapporo. That's not much of a choice, but Sapporo is as good a beer as any other, especially with sushi. We asked for iced tea and the waitress brought out two cans of Japanese imported green tea. I would have sent it back, thinking it would be like some sweetened Nestea or something. But I was glad I didn't because it actually turned out to be quite tasty. The bill was very cheap in the end. For four rolls, six Nigiri sushi, two iced teas and three beers, we paid less than $40. That would have run us at least $60 at Sushi Sushi or Spices and at least $80 at Sushi-Ko. Now was it as good as those other places? It was certainly better than the sushi at Sushi Sushi and Spices, although I'd say that Sushi-Ko was better. But twice as good? Probably not. I'll finish this review with a cute Noah story....About halfway through eating our sushi, Noah started to cry. Amy picked him up and was successful at calming him down. I continued to eat and a little while later Amy handed him over to me so she could eat as well. I liked the BBQ eel roll so much I asked for another and that was where the fun started. 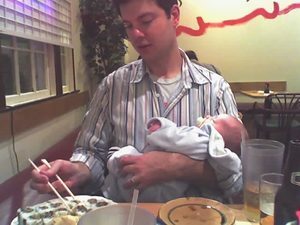 Imagine eating sushi (with chopsticks) with one hand and rocking a baby with the other and all the while singing "Love Me Do" softly. I mastered that act quite well I believe. For my next great foodie feat, I'll do the same, but I'll eat a whole lobster at Oceanaire Seafood Room instead. My friend Monica, cookbook and freelance writer extraordinaire, needs your help collecting recipes for a fundraising cookbook for the local non-profit Center for Multicultural Human Services. You can read all about the cookbook and the CMHS on Monica's web site at this link. By now, you all know that Todd Kliman recently moved to the Washingtonian from the Washington City Paper as Dining Editor. It was a great day for readers of the Washingtonian and a horrible day for people who like to get a good free read about food from The City Paper. Well, I was just told today that Todd Kliman will be having a weekly chat on the Washingtonian web site, every Tuesday at 11 AM. This seems very similar to the format that The Post's, Tom Sietsema uses. Here's the link to post a question. On October 5th, dine out and help benefit The Red Cross hurricane relief efforts. Restaurants across the country are donating a portion (some 100%) of their profits that day to help survivors of hurricanes Katrina and Rita. Some of DCs finest restaurants are participating: Le Paradou, Equinox, Kinkeads. Cafe Mozu is donating 100% if their profits that day. See the complete list of restaurants here.